Notes: Two versions were released. The first version had a single shoulder strap that would often be too loose. Later, the StarBelt was changed to more of a harness design (as pictured). 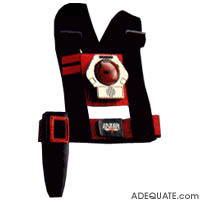 The StarBelt was only available in the Lazer Tag Game Kit with a StarLyte and StarSensor.